The Brains trust became a term applied to the so-called group of advisers to Franklin Roosevelt during his presidential administration. Roosevelt’s speechwriter and legal counsel Samuel Irving Rosenman (1896–1973) suggested having an academic team to advise Roosevelt in March 1932. This was really for show, for being such a member is rarely ever taken seriously by the politicians involved. They have their own ideas and listen to few if any non-political types. Nonetheless, this concept was perhaps based on a group of academic advisers that President Woodrow Wilson formed in 1917 to prepare for the peace negotiations following World War I. It was the journalist James Kieran of the New York Times in 1932 who coined the term “Brains Trust” when he applied it to this group of “experts” who Roosevelt actually ignored. 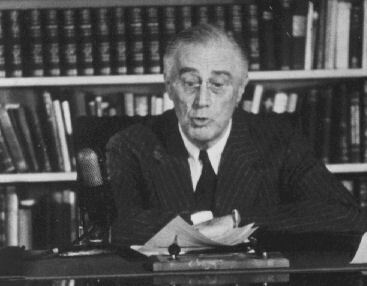 It was on September 6, 1932, when it was reported about Roosevelt’s “brains department” that was helping him create policy positions and make speeches. The Times of September 9, 1932, called this same group a “brains trust.” Newspapers began to call it a “brain trust” by at least October 17, 1932. 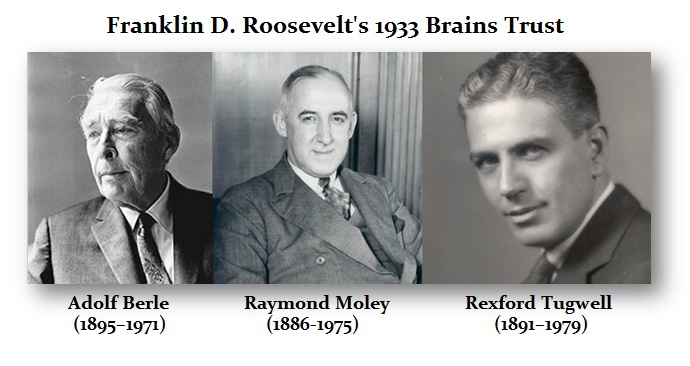 The core of the first Roosevelt brains trust consisted of a group of Columbia law professors Adolf Berle (1895-1971), Raymond Moley (1886-1975), and Rexford Tugwell (1891-1979). Note that they were lawyers, not market investors, technicians, or economists. They knew how to get around the Constitution, not straighten out the economy. Still, these were the men who played a strategic role in shaping the legal policies of the First New Deal in 1933 – not the economics. They also never actually met together as a group. They each were solicited for their LEGAL opinions by Roosevelt Roosevelt expanded his Brains Trust adding James Paul Warburg (1896–1969) who was the son of the famous banker Paul Moritz Warburg (1868–1932). Nonethless, James lacked the banking experience of his father. Louis Dembitz Brandeis (1856–1941) was another lawyer who became a Supreme Court Justice. Another lawyer educated in Chicago also joined the Brains Trust, Harold Lill Ickes (1874–1952). 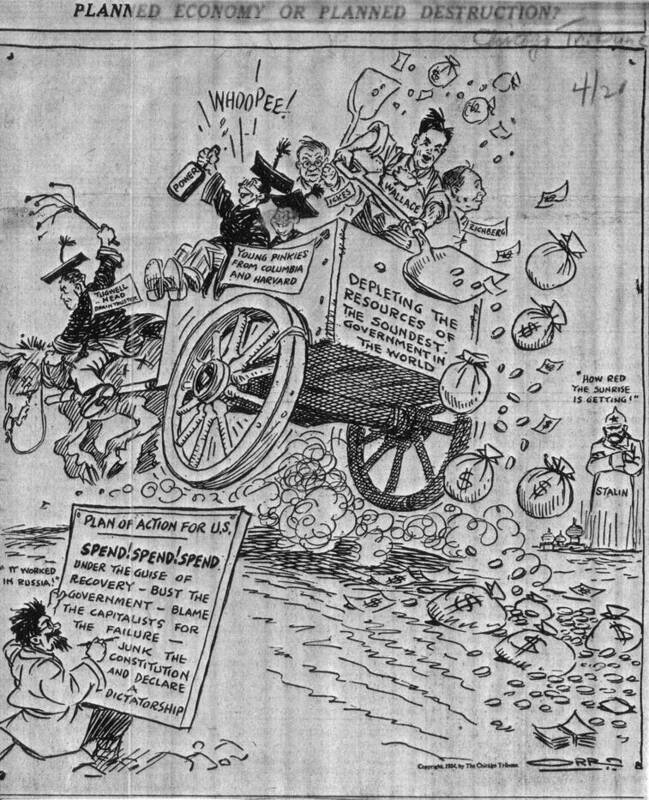 There was the social-activist among the time whose philosphy was that created jobs was better than handouts and created the WPA – Harry Lloyd Hopkins (1890–1946). The first woman appointed was Frances Perkins (1882–1965) whose background was chemistry and physics and at least had a vision compared to the lawyers and brought in the labor movement becoming the U.S. Secretary of Labor from 1933 to 1945. Another lawyer was Basil O’Connor (1892-1972) who went on to become head of the American Red Cross. 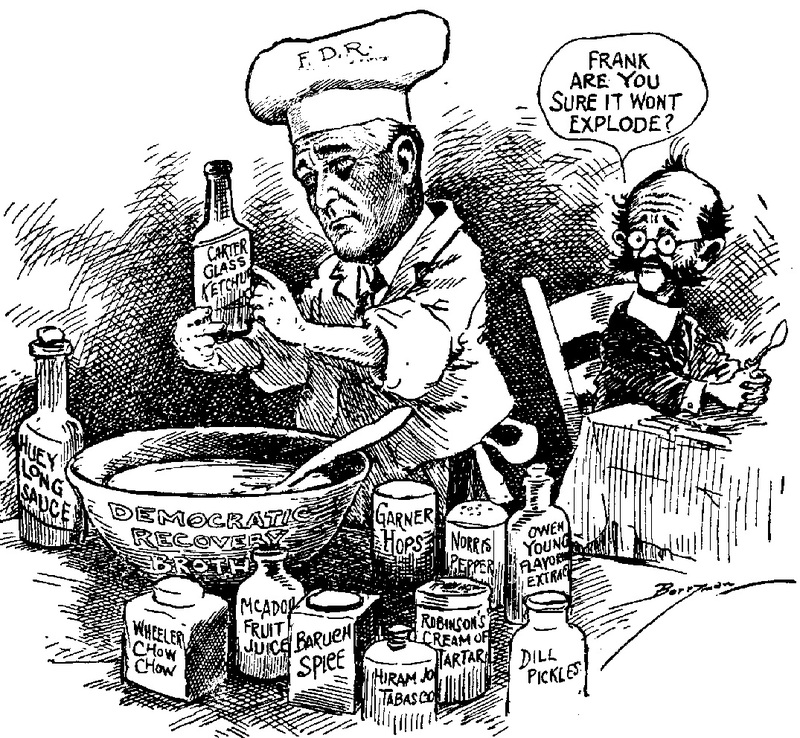 Roosevelt’s Brains Trust was the subject of many newspaper editorials and editorial cartoons ridiculing them as impractical idealists. The image created was that these men where restructuring the economy when in fact they were lawyers. It was getting around the Constitution that was the focus. The core of the Second Roosevelt Brains Trust emerged from men associated with the competing Harvard law school Benjamin V. Cohen (1894–1983), Thomas Gardiner Corcoran (1900–1981), and Felix Frankfurter (1882–1965) who became a Supreme Court Justice although he was born in Vienna. These men played a key role in shaping the policies of the Second New Deal (1935–1936). There was also Hugh Samuel “Iron Pants” Johnson (1881–1942) who graduated West Point and went on to get his law degree from Berkeley University in 1916. None of Roosevelt’s Brains Trust were ever experienced in economics. Most were simply lawyers trying to get around the Constitution. Moley broke away in disagreement with Roosevelt becoming a sharp critic of the New Deal. It was George Warren who was the farmer-economist out of the mainstream whose idea was the devalue the dollar. The Brains Trust totally disagreed and they had nothing to do with the devaluation of the dollar. 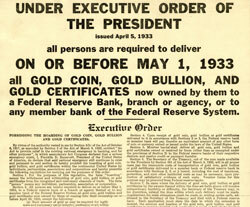 The confiscation of gold was a whole new issue. This was primarily done to ensure that the government would make the money on the revaluation of gold and not the public. It was also the idea of preventing the hoarding of money that was a serious issue at that point in time. 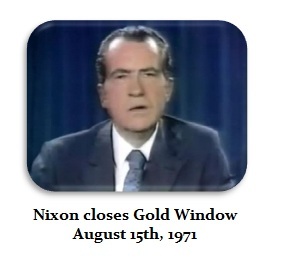 Eventually, the gold standard collapsed forcing President Nixon to close the gold exchange window in 1971 because there was no mechanism to revalue gold in proportion to inflation and the increase in money supply. You cannot fix the price of “money” without fixing everything else. If wages rise and prices are free to float as well as real estate, then they do so against money meaning it then purchases less. Therefore, it is impossible to create a gold standard with fixing the price of gold without fixing the price of everything else, which is effectively communism. This process began with silver rising as an industrial metal forcing President Kennedy to abandon silver in his Executive Order 11110 in 1963. This was then followed by the first crack in the Gold Standard in 1968 whereby a two-tier market began with gold trading in London at a free price which the member nations maintained the Bretton Woods fixed rate of $35. Hence, the economic pressure began during the early 1960s and it was JFK who began the process that led to the free floating currency system.